Here is a card I made for 3 different SCS Challenges last week. 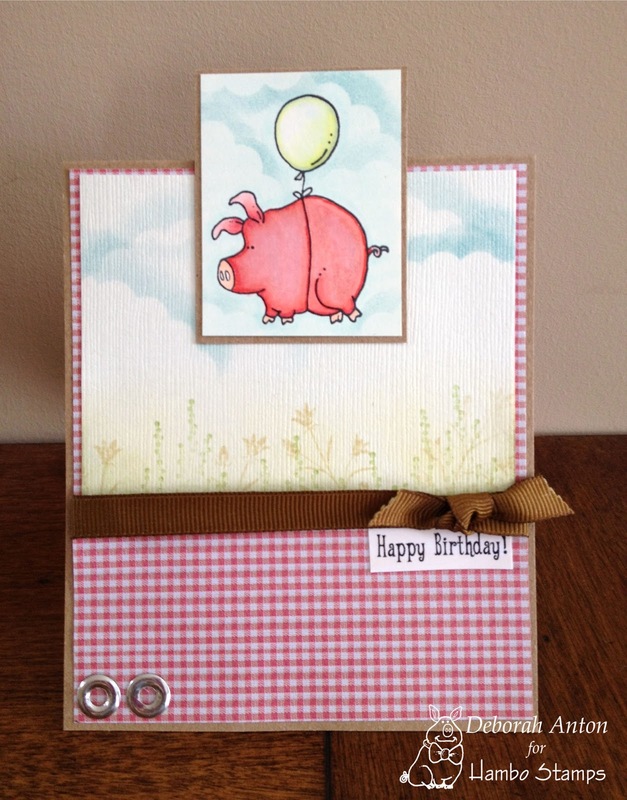 It done using Hambo Stamps of the Floating Pig. I just love this image! He is too cute and reminds me of Winnie the Pooh. 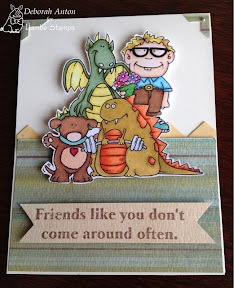 The challenges I did was Monday's Clean and Simple At the Zoo, Thursday's Ways to Use it Stamping Nostalgia, and Friday's Free for All of a tent topper card. Stamping Nostalgia was hard as you were to create using only bare minimal items... no dies or other new things for stamping. Stamping like it was "back then." 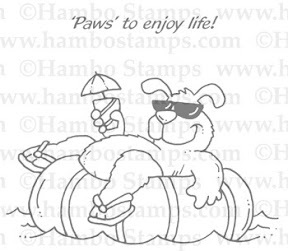 It's funny because you forget how minimal it was to stamp until you can only use those things. However, how simple my stamp area would be if it were still like that!! 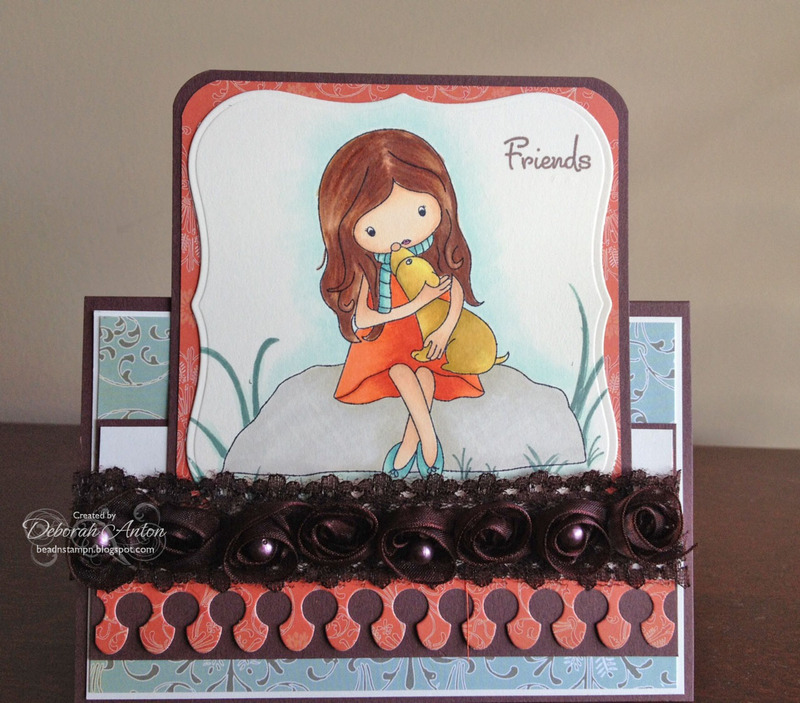 : ) The scene was created using a scrap scallop circle to sponge the sky and SU! set of Mini Silhouettes for the plants. Super simple and super "nostalgia!" Thanks for stopping by and hope you have a great Monday!! 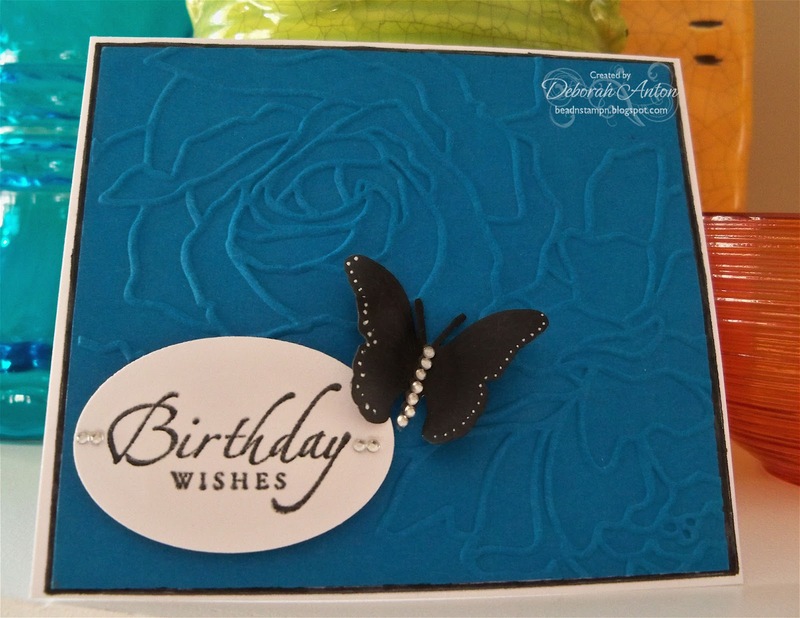 Here is a quick card I made using a fun product on my butterfly. This film, although thin enough to cut with your die cuts, is tough to cut out intricate designs. My butterfly is from The Cat's Pajamas. 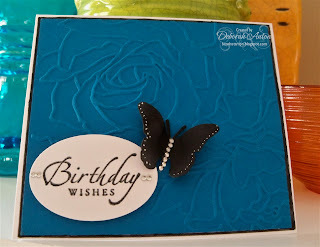 It's the exotic mini butterflies and it has detail cuts throughout. 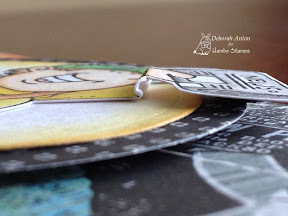 I used a Vagabond machine and for those of you who know, it is probably one of the toughest die cut machines out there enabling it to cut out so many things! BUT... with the film, it could not cut through the intricate designs on the butterfly, even passing it through 3-4 times!! Maybe it's the die and I haven't tried another intricate die, but my thought is that it won't work. I tried this die even with a shim!! But that is ok!! It left the lines on the butterfly where the detail work is and still turned out nicely. This simple card was made from some cs I had from SU! and it's embossing folder. The sentiment is also SU! 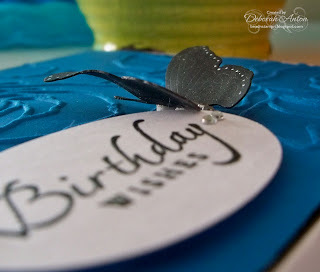 which I stamped in Versamark, then with Momento, added some clear embossing powder and heated with my heat gun. I punched out the sentiment with my oval punch and popped it up on the embossed panel. I finished it off by adding some self adhesive rhinestones down the body of the butterfly and next to the sentiment and popped up the butterfly. Well, I am off to volunteer at the school today as a proctor. This week has been the state standardized testing and thankfully it's the last day!! Woot! I know that my boys school is under a little bit of pressure since they are the only school in county to be in the top 5% of the state based on these test scores. I am sure they want to stay there! :) Have a great Friday and thanks for stopping by! It's another week which means another Hoedown Challenge! this week we are featuring Goat! Doesn't he just want to make you sit on a swing sipping some tea? Or maybe it's the background I used. Lol! Speaking of the background, here is the challenge.... It is to use something recycled. 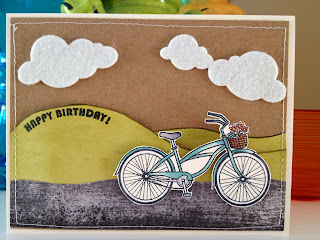 I recycled a post card I had with this background. Quite appropriate I think? I feel like it is missing some bling on the card, but I just didn't have anything that wouldn't make the already busy background more busy. Simple is good! I colored the image with my Copics and popped it up over a nestie label. I then finished it off with some twine and the sentiment strung through. Be sure to stop by the Hoedown and see what other creations the Bacon Bits came up with and leave a little love! And then come back and play along! I hope you have a great day! I hope you all had a great weekend!! 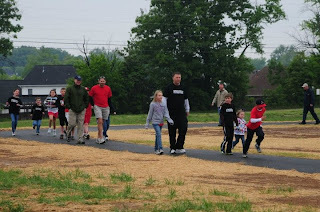 It was C-O-L-D here but the boys had a Walk/Run a-thon at thier school to commemorate the new walking track they put in. Our boys are in the schools running club, so the club was first to walk around the track with the principal, mayor, and city officals before running the laps to raise money. 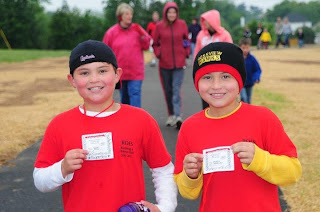 They had so much fun and ended up running 33 laps around!! 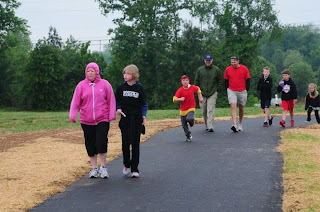 It was about a mile or a little longer. We also got a new addition to our family!! My sister had her baby girl last week and we are all so excited to meet her. It is her second child and because she lives in Switzerland, we don't get to see them all right away. But in June we will!! So exciting! Pictures of it all are at the end of this post. I just wanted to share with you a quick canvas project I made for our living room. 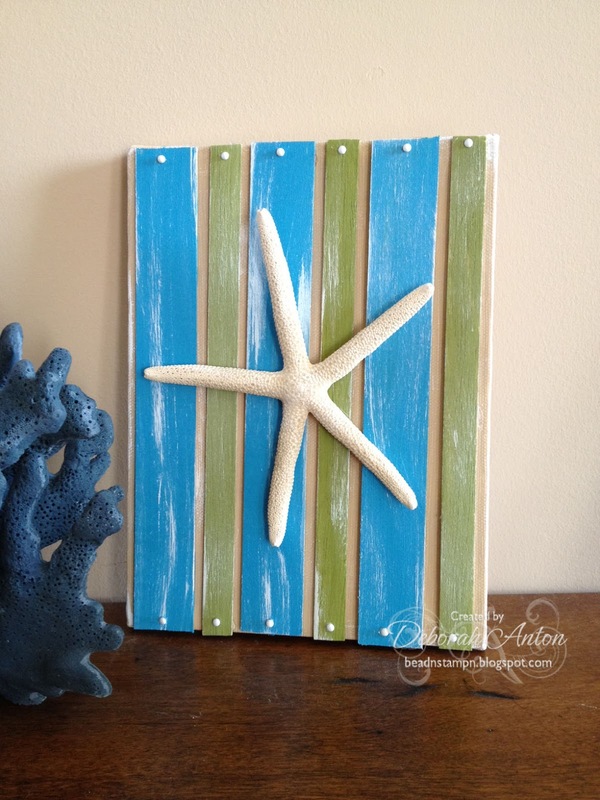 We have a beached themed living room and I had this idea to make a small decor item for it using a small canvas an some thin basswood. I painted the canvas a light beige and measured and cut the thin basswood to size. I painted that in my choice colors and then dry brushed lightly with white over it. I used my hot glue gun to adhere the wood and used up some of my mini white brads with the tails cut off to add to the ends. I then glued on the fingered starfish to the center. 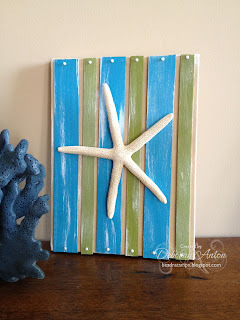 Super simple and makes for a nice clean beach decor for our shelf. I will probably make more items similar to this but using different materials I think. 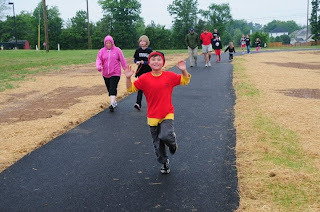 Here they are at the end showing off the ticks for each lap they ran! Thanks so much for stopping by and taking a peek into my project and at my family!! : ) Have a great day!! It's Friday!! Wow! Fast week wasn't it? Today I want to share a quick card I made for a friends birthday. Thursday already!! Wow... another week flew by! This card was made with MFT's new A la Mode image of An Apple for Teacher. I am trying to get a little ahead with Teacher appreciation week coming up! I used last weeks MFT sketch on SCS too. I colored in the image with my Copics and used MFT's Die-namics for the purple border. The dp is Paper Studio while the red dots are Bling! I popped up the image and kept the whole card clean. Thanks so much for taking a peek and have a great Thursday!! Time to Hoedown folks!! And I can't help to think of Lumiere from Beauty and Beast with this image! LOL! 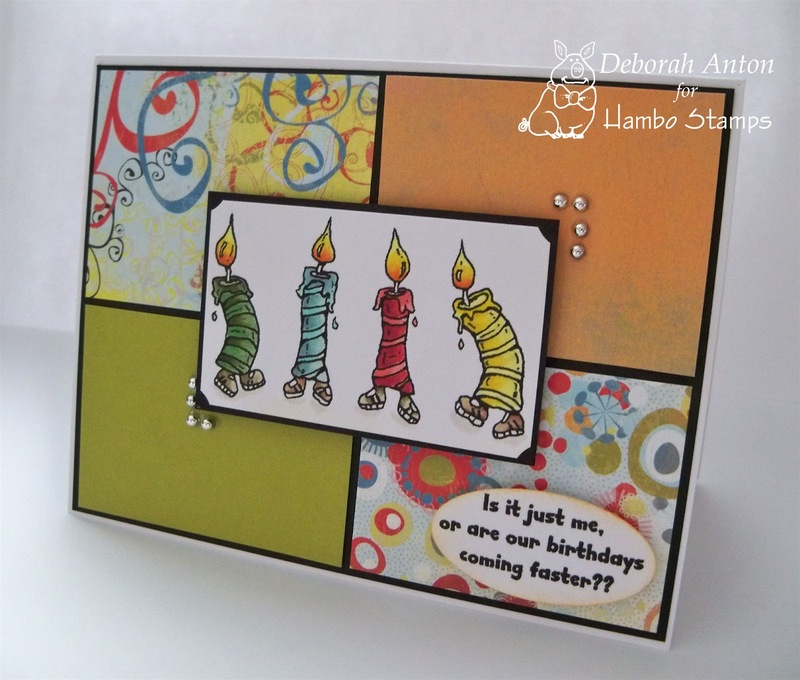 Candles... the name of the Hambo digi image. And the challenge this week is to use 4 of something! The candles don't count! :) I used four different dp's all from Basic Grey's Cupcake Collection. I colored in the image with my Copics and popped it up. I finished the card up with some self adhesive metal dots. The sentiment is one of three that it comes with which I punched out with my SU! Oval punch and edged with some distress inks. We hope you are able to play along for your chance at a free digi!! Don't forget to see what the other Bacon Bits came up with for this challenge and leave them some bloggy love!! Thanks so much for stopping by! Did you see it? 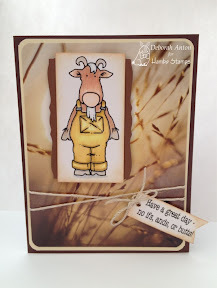 Yesterday's fun Make 'Em Laugh Blog Hop at Operation Write Home? fabulous sponsors and awesome prizes that could be won! You need to check it out! 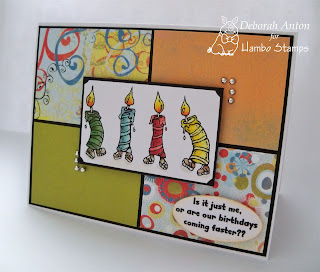 This card is the one I made to share on the Hambo Talk to the Ham Stamps Blog for this hop. I had fun making it and spent some time on Photoshop doing it! I used MME dp and MFT Die-namics Chevron die for the chevron inside while I used the negative of that for the outside. I colored in the image with my Copics and cut it out to be popped up. 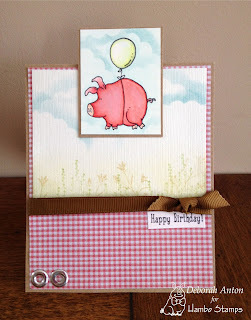 I stamped the sentiment on the coordinating dp cut out some corners for the top. I hope you have a chance to check out this awesome blog hop and very worthwhile cause! Thanks so much for stopping by! Nope.... I'm not calling anyone a nerd! :) just this cute little guy I will be sharing with you for this weeks challenge at the Hambo Hoedown! For the challenge, you are to use plaid or multicolor blocking. I just had to use plaid because, really, how could you not? :) I colored in Erkel (yes I named him) with my Copics and popped him up. I used MME dp<, a target="_blank" href="http://mftstamps.com/">MFT's Pinking Border Die-namics for the pinking border and MFT's banner Die-namic for the banner tags. I finished it off with some metal self adhesive rings. 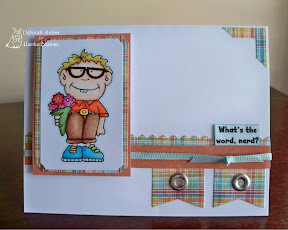 This set comes with 3 sentiments: smitten, Happy Mothers Day, and this one... What's the word, nerd! Erkel is just too cute to not want to add him go your collection! Thanks so much for popping in! Have a great day! I hope you all had a wonderful Easter!! Ours was quiet with the kids and with a school project due today, busy finishing that!! For this image, I colored her in with Copics and used my nesties to cut the image out. I used American Crafts for the dp and SU! Chocolate Chip cs for the the base. 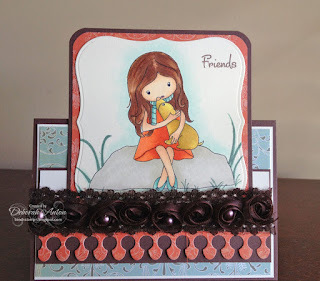 I then used my MFT Die-namic crown border but decided to use the negative instead. I liked the unique look it gave. I finished it off with some left over rose trim I had from another project. I used the actual cut out from the MFT Crown border die for this along with the large fancy flourish die. Thanks so much for taking a peek and hope you all have a great Monday!! I just wanted to drop in quickly to remind you to check out Talk To The Ham to see if you are one of the winners from the April Fools Slop Hop! All the details on on the blog on how to claim your digi! Paper Boy at the Hoedown! Wow! Is it really Wednesday already?! This week has been me playing catch up with getting things in order since we were gone last week, but I think I am just about there! 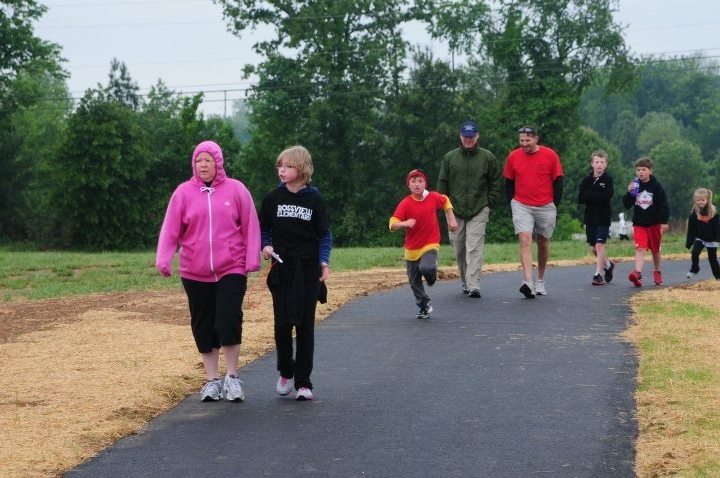 Thank you to everyone who joined us on April Fools for our Go Ahead And Laugh At Us Slop Hop! I know we had fun doing it and we hope you all had some good laughs! I had a blast reading all the dreamy places you have/had in mind of where you would or will be vacationing this summer in my comments. I think I have added a few places to my bucket list thanks to you all! This weeks Hambo Hoedown challenge is using the image Paper Boy. I used Basic Grey's dp called Out of Print and colored the image using once again my colored pencils by Koh-I-Noor and odorless mineral spirits. I love these pencils as they are woodless and just seem to blend like buttah! 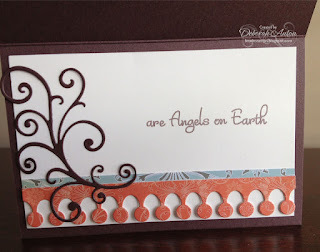 For my border, I used MFT Die-Namics crown border. The ribbon is from my stash of no namers. We hope you play along this week at the Hoedown! Thanks so much for stopping by and taking a looksie! Don't forget to check the Hoedown blog tomorrow to see if you are a lucky winner of one of the fun digi images the Bacon Bits had up for grabs! Go Ahead and Laugh At Us! Hambo Stamps Slop Hop! Why did the pig go to the casino? To play the slop machine! Thank you, thank you! I'm here all week folks! Ok...wipe those laughter tears and follow along... If you arrived here from Monica's blog, you are in the right place. If not, you will want to start back at the beginning at the Hambo blog – TALK TO THE HAM. We don’t want you to miss anything! Deborah --------------> You are here! Get ready to laugh as you slop your way from pig pen to pig pen and seeing what all the other Bacon Bits have created! There is even some free digi's to be won by a random winner on each of the Bacon Bits blog! A little surprise is hiding on one of the blogs today, so be sure to leave some comment love as you “hoof it” around the hop. One lucky commenter on the mystery slop spot will be in hog heaven and win a $15 gift certificate to Hambo Stamps! I am giving away Cool Dog! All you have to do is comment here and tell me where you would like to vacation this summer! I love comments anytime, but the deadline for prize entries is Tuesday, April 3 at midnight CST. For those of you who commented a few days ago on Hop Arts Design Day, those will be counted! I accidentally added this giveaway then instead of today. Winners will be announced on the Hoedown Blog April 5th so be sure to check! 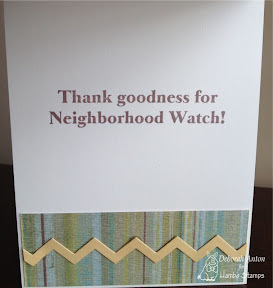 My card today is done using Silly Birds and Neighborhood Watch for the sentiments. I couldn't help but put these silly birds together with this fractured funny! 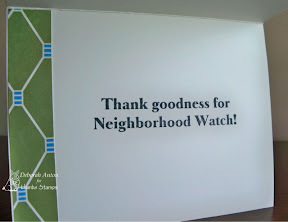 At least for me, it seemed fitting to have this card somewhat mimic my neighborhood friends in our last duty station! We were silly like that! I stamped the image and colored it in with Copics. I used American Crafts dp and some scrap SU! Turquoise cs. 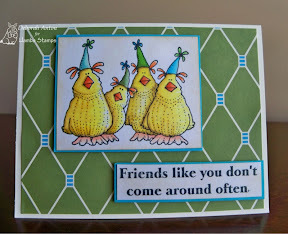 I could have embellished this card but the image is a good size that I didn't want to cover anymore of the dp as I felt the chicken wire look fit it well. 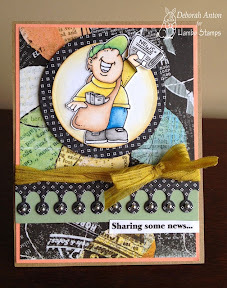 I used some left over dp for an inside strip before stamping the sentiment with Momento Black ink. Next up on the hop is Dawn. You will love what she has to show you today! Thank you for stopping by and taking a peek! Have a great April Fools!